Disciple of Dr. Francis Barboza. Sunday 8th July, 2007 - 4 P.M.
Sruthi Edison was born on October 3rd, 1989 in Kanjirappally , India . She had her primary education in Kuriachira, Trichur. From childhood itself she was interested in arts, music & dance. She started learning Bharatha Natyam from Dr. Francis Barboza since 2002. Sruthi is the second student to graduate from Satyaradhana, Institute of Performing Arts under the able guidance of Dr. Francis Barboza. She has performed in the Ballet, Preethinrityeswar and has toured several parts in the USA with the dance troupe of Dr. Barboza such as St. Louis , Wisconsin , Connecticut , etc. She has been active in TV shows, such as Asianet hosting including interviews. Sruthi has acted in Malayalam drama affiliated with one of the major promoters of cultural activities in the tri state area; Fine Arts Malayalam. 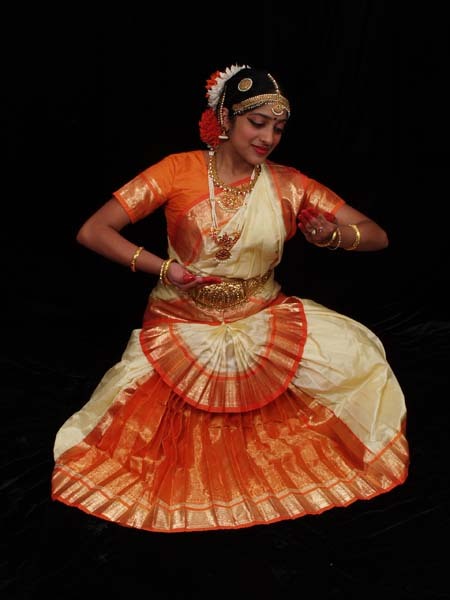 She has participated in various dance programs for many different cultural events. Sruthi speaks, reads, and writes her native language Malayalam fluently. She manages to balance her values and culture as a proud Indian as well as an American. Her main interests are listening to music, dancing, taking long walks with her mother, etc. Sruthi is an honor roll student at West Orange High School . She has been an executive member of Unity Club, Prom committee, etc. Her father Edison Abraham is a Sonographer and her mother, Tessy Edison is a Registered Nurse. They have given tremendous support for Sruthi through out the years of her in this world for various activities she has took part in, especially Bharatha Natyam. At present she is a graduate of WestOrange High School and plans to major in Nursing in Felician College .